An updated look at the Seahawks' stats reflects the team's stellar play over the past month. Another week, another blowout win, another big offensive performance, another dominating defensive one. It all adds up to statistics on both side of the ball for the Seahawks that continue to mostly glitter. TOTAL OFFENSE: 382.2 yards per game, fifth in the NFL. The Seahawks have finished in the NFL’s top five in total offense only three times — second in 2005 (369.7 yards per game), third in 1997 (359.9) and third in 1978 (344.4). And yes, 344 yards per game ranking 21st shows how the NFL has changed over the years. The Seahawks are on pace for 6,115 yards, which would break the team record of 6,012 set last season (which was an average of 375.75 per game). Seattle is also averaging 6.0 yards per play, which would also be a team record, breaking the 5.88 of last season. And to think that after the Dallas game the offense appeared to be the big weakness. The revival since then has been stunning, as the Seahawks have scored 29 or more points in all five games since then — they had never before scored 29 or more points in five consecutive games — while averaging 428.8 yards. And obviously quarterback Russell Wilson’s numbers continue to be out of this world. Wilson is on pace for 4,048 passing yards, which would break the team record of 3,966 set by Matt Hasselbeck in 2007, and is on pace for 32 touchdowns, which would tie the team record set by Dave Krieg in 1984. Wilson also leads the NFL in passer rating at 110.0, which would shatter his team record of 101.2 set in 2013 and at the moment is the 14th best of all time. Wilson has had a passer rating of 138.5 or better each of the past four games, the only time that has happened in NFL history. RUSHING OFFENSE: 144.8 yards per game, first in the NFL. This number dropped slightly from last week’s 146.6, and obviously this will be the big area to watch going forward with Thomas Rawls out for the season. And as a sign of how much stats can fluctuate week to week, the Seahawks’ yards-per-carry average dropped from 4.8 last week to 4.6 this week, due largely to the team getting just 57 yards on 25 carries from Fred Jackson and DuJuan Harris after the loss of Rawls, who had picked up 44 on six before being injured. Seattle dropped from first in the NFL in yards per carry last week to seventh this week. Sunday’s game against the Browns will be an interesting test of where Seattle’s running game stands, as the Browns are 28th against the run at 4.5 per carry (meaning, Seattle should be able to run it, anyway). Seattle’s per-game total would not rank among the top three in team history — the best rushing season in Seattle history came last year when the Seahawks gained 2,762 yards, an average of 172.6 per game. PASSING OFFENSE: 237 yards per game, 19th in the NFL. The Seahawks were 28th in the NFL in passing heading into the Dallas game but have moved up by passing for an average of 289.75 the past four games (and remember that Seattle’s overall passing totals differ slightly from Wilson’s due to sacks being counted against passing yards). Still, this is a pace for 3,792 for the season which would be not far off the best in team history — the record is 4,078 yards in 2002. In what is a more important number to Pete Carroll, Seattle is averaging 8.5 yards per pass, second in the NFL. That would be a team record, bettering the 8.35 of 2013. Doug Baldwin is now on pace for 75 receptions for 1,058 yards and 14 touchdowns, all numbers that would be among the best in team history. Baldwin has 11 TDs and needs one more to tie the single-season team record of 12 set by Steve Largent in 1984 and Joey Galloway in 1997. His receptions would be the most since T.J. Houshmandzadeh had 79 in 2009, and his yards the most since Bobby Engram had 1,147 in 2007. OFFENSIVE POINTS PER GAME: 26.2, sixth in the NFL. The Seahawks are on pace to score 419 points this season, which would be the best of the Pete Carroll era — they had 417 in the Super Bowl-winning season of 2013. The team record is 452 by the 2005 Super Bowl team. TOTAL DEFENSE: 307.8 per game, tied for second in the NFL. The Seahawks are tied for second in yards allowed per game with Carolina and behind the 272 of Denver. 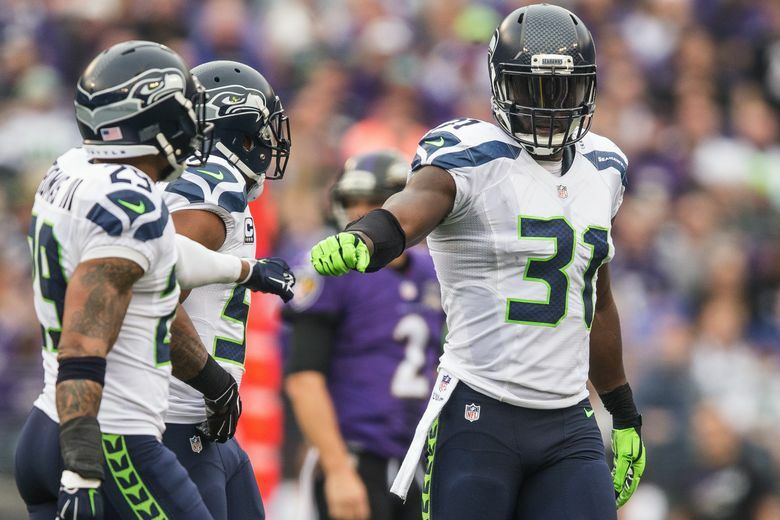 As we wrote last week, the Seahawks have not been as dominant defensively this year, and the numbers indicate that. Though again ranked among the best defenses in the NFL in yards allowed, Seattle is not quite on the pace of the previous few seasons when they set a number of team records. Seattle allowed just 267 yards per game last season to set a team record, which was just a little better than the 273.6 of the 2013 Super Bowl champs. And also up a little bit is Seattle’s average yards per play allowed of 5.1. The Seahawks allowed 4.6 last season and 4.4 in 2013. But the numbers have been good of late as Seattle has allowed just 477 the past two weeks, an average of 4.6 per play. RUSHING DEFENSE: 83.2, second in the NFL. The Seahawks trail only the Jets at 78.9, though their 3.6 yards per attempt allowed is tied for third behind Denver’s 3.3 and Tampa Bay’s 3.4. Seattle has allowed just 174 yards the past four games, 43.5 per game, on 60 carries, 2.9 yards per attempt. Seattle remains just off the team record in rushing yards allowed per game, set last year at 81.5. PASSING DEFENSE: 225 per game, sixth in the NFL. The Seahawks oddly dropped from third in pass defense to sixth while going against Jimmy Clausen, whose 178 passing yards in the first half were one of the few negatives of the weekend. As this remains one area where there is a dip from past seasons The Seahawks allowed 185 per game in 2014, and just 172 in 2013. What is beginning to look a little more normal is the passer rating against the Seahawks of 81.9. That number was 80.4 last season, with nothing likely ever to match the 63.4 of 2013 when the Seahawks had 28 interceptions. Seattle has just 10 picks this season. DEFENSIVE POINTS PER GAME: 18.1, 3rd in NFL. Here is another stat that has begun to come down a lot in recent weeks. Seattle is now on pace to allow 289 points for the season after allowing 254 last year, 231 in 2013 (the team record) and 245 in 2012.